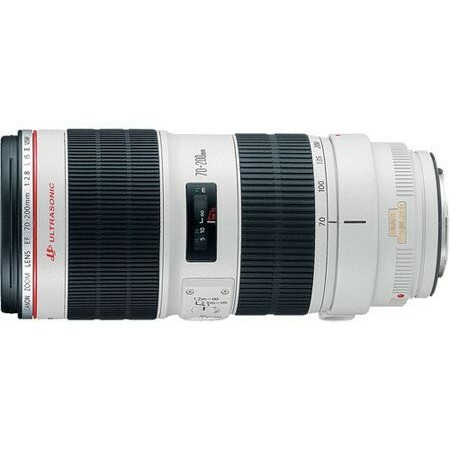 The most celebrated 70-200mm lens in the Canon EF line. 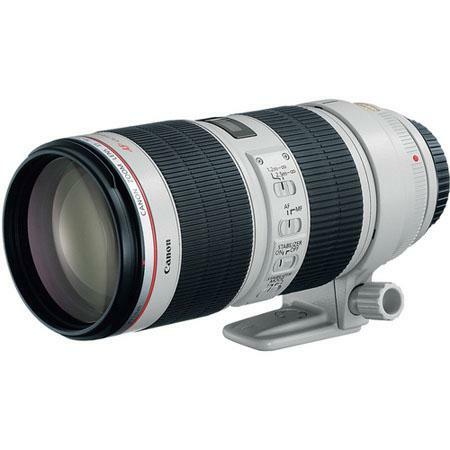 At $2500 this is the most expensive 70-200mm medium telephoto lens that Canon offers. The best thing about this lens is the presence of IS II. For a lens that offers a 200mm maximum focal length range the presence of IS is a critically important requirement. At this high range even if you have very steady hands, the slightest of camera shake is magnified. The presence of the next generation of IS means that the lens can be hand held for slower shutter speeds of up to four stops without issues. Additionally the presence of USM (Ultra-sonic Motor) ensures that the lens is silent when auto-focusing. This is not the cheaper Micro Motor variety USM but the advanced Ring-type USM that Canon uses for its higher end L series lenses mainly. Additionally full-time manual focusing is present in the lens. All one needs to do to shift to manual focusing is to turn the focusing ring without having to flick the mode switch. There are a total of 23 elements arranged in 19 groups. Canon has provided a total of five UD (Ultra-low Dispersion) glass elements and one fluorite element in the lens ensuring that the lens has little to now effect from Lateral Chromatic Aberration (LCA). The overall construction of the lens is extremely good. The build quality of the lens is befitting its L series tag and the lens is protected against water and dust related issues thanks due to its weather sealed construction. The external dimensions of the lens are 3.5 x 7.8” and it weighs 1490 grams. 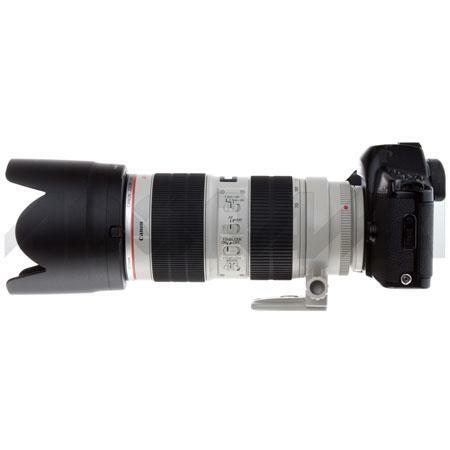 If you are in tight budget you can also consider Canon EF 70-200 f/4L IS. Along with its redesigned optical elements, the new lens design features improved AF speeddue to a new focusing algorithm and has reduced the minimum focusing distance to 3.9 feet (1.2 meters) through the entire zoom range, allowing photographers to capture tighter portraiture shots in a small studio space. The previous lens model’s minimum focusing distance was 4.6 feet (1.4 meters), whereas now photographers can stand nearly 8 inches closer to their subject and achieve sharp focus and tight crops. Canon has also enhanced the Image Stabilization allowing it to compensate for shutter speeds up to four steps slower than 1/focal length, a one step improvement over the previous lens model. The enhanced magnesium alloy barrel design of the EF 70-200mm f/2.8L IS II USM lens features added strength with a minimal 20-gram increase in weight compared with the previous model (1490g vs. 1470g) and retains Canon’s protective seals and fittings providing dust and water resistance for those photographers working in adverse conditions. A new bayonet mount on the front of the lens includes a locking mechanism to ensure the supplied lens hood remains securely in place. Other noticeable improvements include a wider focusing ring, andsleeker design by reducing the thickness of any protruding elements such as the switch panel. The new lens is also compatible with Canon’s existing EF1.4X II and EF2X II Extenders as well as EF Extension Tubes and the 77mm Close-Up Lens 500D. Canon U.S.A., Inc. is a leading provider of consumer, business-to-business, and industrial digital imaging solutions. Its parent company, Canon Inc. (NYSE:CAJ), a top patent holder of technology, ranked third overall in the U.S. in 2008†, with global revenues of US $45 billion, is listed as number four in the computer industry on Fortune Magazine’s World’s Most Admired Companies 2009 list, and is on the 2009 BusinessWeek list of “100 Best Global Brands.” Canon is committed to the highest levels of customer satisfaction and loyalty, providing 100 percent U.S.-based consumer service and support for all products. At Canon, we care because caring is essential to living together in harmony. Founded upon a corporate philosophy of Kyosei – “all people, regardless of race, religion or culture, harmoniously living and working together into the future” – Canon U.S.A. supports a number of social, youth, educational and other programs, including environmental and recycling initiatives. Additional information about these programs can be found at www.usa.canon.com/kyosei.